As those of you who have read my short bio know, I live in Puerto Rico. For three days, hurricane Irma made it impossible to do anything but read, as wind and rain knocked off most of the island’s electricity. I made sure to charge my Kindle way ahead of the storm, and spent most of it reading! If you're wondering, I am fine. The east side of the island got the worst of the storm, and I live in the west side. For the last month, I’ve been scanning the Top 100 Free list for those rare books that are both really good and free. I found that those books are usually free only for a few days of special promo, and by the time I finish a book, it’s off promo and no longer free. However, a good book, regardless of price, is worth recommending. During Irma, I read a few books I'd downloaded from the Top 100 Free over the last few weeks. 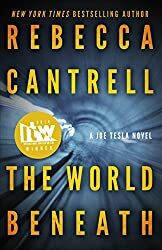 The World Beneath by Rebecca Cantrell is one such book. I read it in one day because I could not put it down! It's a mystery that begins in 1949 when a former Nazi scientist working for the U.S. government is bricked-in alive (as in "The Cask of Amontillado") in the subterranean tunnels of New York City and forgotten. Jump to present New York City where a contract-killer tracks his prey to that same brick wall. The story is imaginative, fast moving, full of tension and atmosphere, and has great characters that include a brave, lovable dog called Edison. I loved the ending too! The book is now $4.99 on Amazon. It's part of a series called the Joe Tesla series.